Last weekend we went to Wheaton, Illinois to attend a baby shower for my daughter and son-in-law. The shower was thrown by Ashley's and Jason's small church group, but I was asked to help with the decorations. Other than spending $25.00 on fresh flowers, all the decorations were either recycled/reused from previous events or were items we already owned. When guests arrived via the front door of the hostess's home, the first thing they saw was this cute sign. My daughter made this for her sister-in-law's baby shower and because they have the same last name Ashley was able to reuse it. The sign was placed atop the gift table. Just to the left of the gift table was the dining table. Ashley wanted the chandelier above the food table to be a focal point so I decorated it with artificial garland and ribbon from her wedding six years earlier. Everyone was awestruck by what I did with this chandelier but it was really so simple. 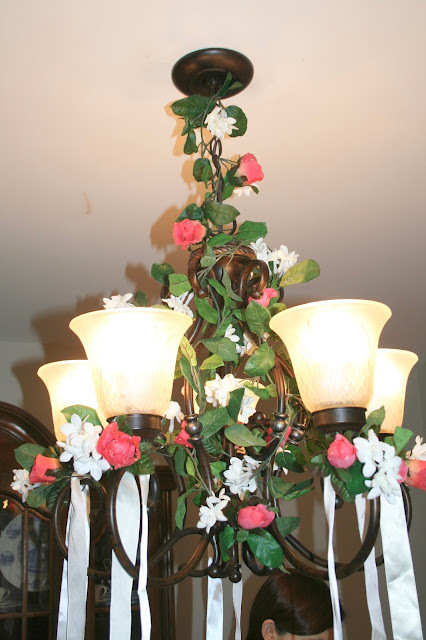 I just took the white floral garland and wrapped it down and around the main stem of the chandelier. Then I took smaller pieces and wrapped those around the light bulb arms of the chandelier. Then below each light bulb I tied a white ribbon and let it hang down. I added a pink rose and white jasmine by twisting the stem of the flowers around the bulb base. I finished off the look by adding more pink roses into the white garland throughout. For the food table, we used a cupcake stand as the focal point. There I added more pink and white artificial flowers, greenery, and ribbon. Two fresh flower vases were added to either side of the cupcake stand. I placed the cupcake stand upon three rose print linen napkins from Ashley's wedding, then I wrapped a light pink artificial garland around all the food items. To the right of the food table was the beverage area. Here I hung a a light green vinyl table cloth (also left over from Ashley's dress rehearsal reception). I knew there would be stains from the punch, so I deliberately used something that could easily be wiped clean rather than a standard table cloth which would stain. I gathered the vinyl up a bit with a white ribbon, then I wrapped pieces of white floral garland around the punch bowls and cups. The cupcakes were delicious, they were purchased from Marianos grocery store. They were a simple vanilla cupcake with vanilla frosting. The Velveteen Rabbit picks were purchased by the hostess from Amazon. I found this cute antique swan vase in my garden shed (you'd be amazed at what is in my garden shed!) and thought it would make the perfect utensil holder. For the eating area we set up two tables and chairs, covered them with table cloths and a fresh flower arrangement. I also decorated the fireplace using napkins, tulle, and garland from Ashley's wedding, and new wall hangings Ashley picked out for the baby's room. I laid the napkins across on a diagonal then placed the wall hangings on top of them. The center wall hanging is sitting atop some books hidden under the napkins for extra height. I then wrapped tulle around the wall hangings and added some garland. Once my base was in place, I added all the other decor: Velveteen Rabbit books purchased by the hostess, an old stuff bunny from Ashley's childhood, a pot of fresh flowers Ashley received from another baby shower, and a tea cup of the hostess's little girl. Ashley and Jason's baby girl is named Aletha....hence the large initial! On each table I set a small vase of soft pink carnations atop a pink floral napkin. I added a mix of transparent and grosgrain pink ribbon around each vase, tied in a bow. Ashley placed a lighted votive on the corner of each napkin. For the coffee table in the living room, I placed a bouquet of daisies atop a pink floral napkin. The pink floral napkins were scattered everywhere for this shower to tie all the decorations together. Well I can't leave you without sharing a few pictures from the shower. We played a couple of games. One of them was a diaper changing race game where everyone was given a doll with a poopey diaper to change. The team who changed the diaper the fastest won. 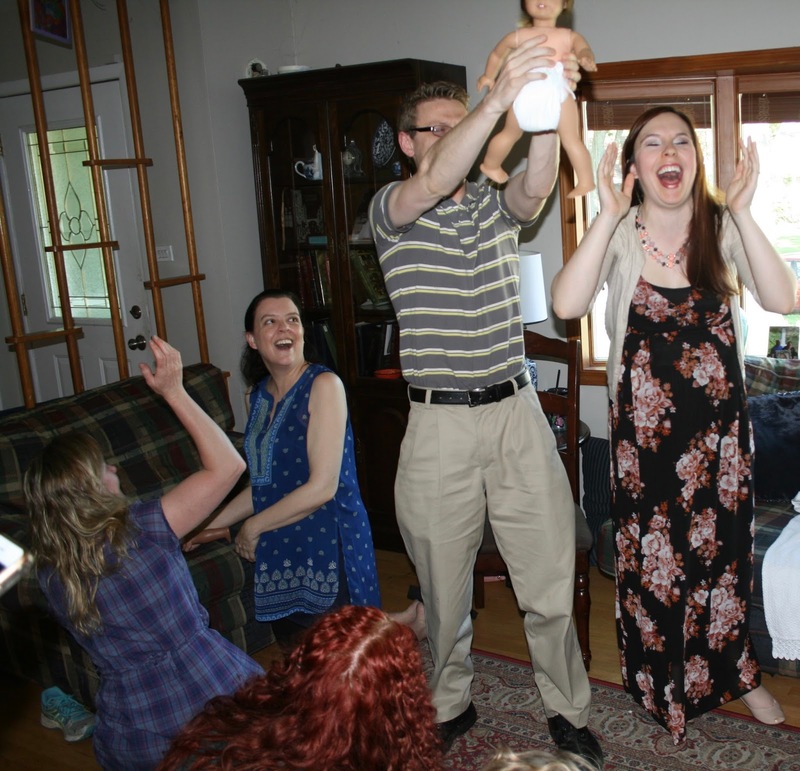 Surprisingly, the couple with the least diaper-changing experience, Ashley and Jason, were the winners! I was paired up with my son who never changed a diaper in his life, so we didn't even have our diaper off before Ashley and Jason were finished. Inside the diapers were tootsie rolls! How fun is that? And if you're wondering what I wore to Ashley's shower, I decided on a pretty, feminine eyelet skirt and top combo that I wore two Easters ago HERE. Since everything I am wearing is exactly the same in that post, I decided not to do a separate fashion post on this outfit. You can go to that post to see that outfit in more detail. Ashley will be blessed with three baby showers. She was thrown a shower by her church's choir, then she had her church's small group shower (this one), and she will also be thrown a shower from her husband's side of the family. Don't you just love these cute black and white leggings? My husband and I bought them them the baby bouncer you see on the far left. We also purchased the baby's crib, and some crib sheets and clothing (not shown). Once little Aletha is born, I will spoil her to death with lots of pretty clothes. She will be the most well-dressed baby in town...my little fashionista! Everyone had such a nice time at this shower. It was such a joyful experience. I just love the expression on Jason's face in this picture. Looks like everyone had lots of fun! Love the pretty decorations and what a great idea to use those pretty napkins along the mantel. I'm sure you'll have tons of fun spoiling the baby girl once she arrives! Thank Elli! Yes, I'm sure little Aletha will be very spoiled by her grandparents. Lovely baby shower, surrounded by your lovely family. I don't think the idea has reached over here yet. You did some great work with the decorations! Thank you! Do you not have baby showers in your country, or did you mean co-ed baby showers? How do you celebrate a new birth? Beautiful decorations, you did an amazing job! What a lovely shower! The mantel decorations were so sweet. We used the very same picks on cupcakes for my granddaughter's first birthday cupcakes. She and her mommy (my daughter) are all about bunnies. The diaper changing game complete with poop was a fun idea. I always do an orientation lesson in the library comparing book care to taking care of a baby. Usually have a Cabbage Patch doll that we all hold, and then put diapers on books for the kids to hold. Next year I will add Tootsie Rolls to someone's diaper and they can get a free book. So fun! Thanks Leslie! I think the kids will love the idea of finding Tootsie Rolls in the diaper. The kids at Ashley's shower thought it was the greatest!